Imagine you had never seen a game of football before, and then you tuned in to Leicester v West Ham yesterday. You would be left feeling a little confused about the rules. I’ve seen a lot of football in my life and I was left utterly baffled by the performance of referee Jon Moss. The job of refereeing is a hugely difficult one but Mr Moss gathered no credit as he attempted to assess the bodies rolling around him. Firstly, the Vardy red card: did he dive? He certainly took steps to ensure that the defender couldn’t avoid making contact with him and he knew that contact would knock him from his feet (more tax avoidance than tax evasion on the moral continuum). I wouldn’t call it a dive and the sending off was very harsh. Next, the penalty awarded to West Ham; Reid falls following a gentle tug from Leicester’s Morgan. A foul? Probably yes on the strictest interpretation of the law but how can Moss penalise that incident when every single corner in the game had produced at least as much if not worse. The pushing and pulling and general nonsense that accompanies every corner these days should be stamped out but it has to be done by all referees awarding around four penalties per game in the first few weeks of the season. Choosing one incident at random as Moss did is a recipe for chaos and sure enough, he brought about a chaotic climax to the game. A few minutes later at the other end, Huth goes sprawling in the box after very clearly having his jump impeded. Moss has a look and decides there’s nothing to see here. The rest of us can see a referee that has considerably less grip on the game than Ogbonna had on Huth. Leicester continue a frenetic scramble for an equaliser and in the very last minute of added time, Schlupp runs into Andy Carroll and, as virtually any man would after running into Andy Carroll, falls over. Moss points to the spot. I’d call it soft but that doesn’t really describe just how lacking in firmness the decision was: it was softer than a blancmange left in front of the fire for ninety minutes. Moss had clearly reassessed some of his earlier decisions and reached the conclusion that he’d been unduly harsh on Leicester. Here he was restoring justice (and parity) with another incredible decision. Leicester fans left ecstatic and relieved. Bilic left with a rueful smile and a scratch of his head. A defeat for Leicester could have been a hugely significant moment in the title race but a draw means that not too much momentum is lost. Tonight we’ll find out a lot about Spurs and how they’re dealing with the pressure. If they don’t win at Stoke, they are unlikely to be wearing Premier League winner’s medals next month. Liverpool’s players still have the chance to claim a medal this season after their remarkable comeback against Dortmund in the Europa League. Yesterday’s 2-1 win away at Bournemouth was even more significant however. Klopp fielded a young, inexperienced, and experimental team and yet they managed a more comfortable and convincing victory than the scoreline suggests. Liverpool’s first eleven is strong (albeit still in need of strengthening) but there’s doubt as to the depth of the squad. Perhaps some of that doubt is exaggerated. Money needs to be spent to turn Liverpool into title contenders and Klopp is the right man to spend it. This Premier League season has been thrillingly unpredictable; just imagine what next season might be like with Liverpool resurgent under Klopp, Guardiola arriving at City, and the prospect of Mourinho at Man United. 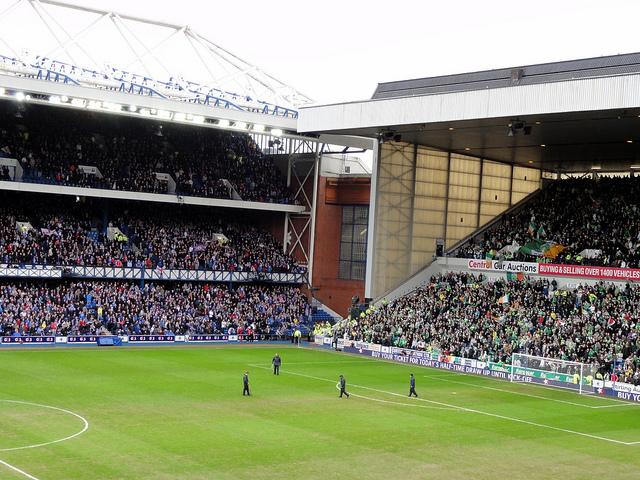 Talking of resurgence, Rangers made a statement yesterday by beating Celtic in the Scottish Cup semi final at Hampden. The fallen Glasgow giants have completed their rise through the leagues and will return to the top division in Scotland next season after easily winning the Championship. The hotly debated topic in Scottish football right now is how strong a force Rangers will be upon their return to the SPFL. Hearts have shown that the transition between the two leagues is not particularly onerous for a club with some resources. Celtic will start next season as title favourites but they can expect their old rivals to be genuine challengers. Will Ronny Deila still be in charge of Celtic when the next Old Firm match is played? I doubt it. The Norwegian’s reign has been distinctly underwhelming and while he’s won the expected league titles (and is likely to do so again this year) his side’s failings in cups and in Europe have put him under severe pressure. Celtic are on a decline brought about by consistently selling their best players and replacing them with lesser quality. It’s arguable the extent to which that is by necessity but the effect is dispiriting for supporters. It also means that any decent player at the club only expects to be there for a year or two before seeking greater riches and profile elsewhere. It’s been a similar scenario of late at my dearly beloved Dundee United (with most of our better players ending up at Celtic). We lost the other cup semi final to Hibs and all we have to contemplate now is our impending relegation. My first blog post of this year heralded forthcoming doom at Tannadice and so it’s coming to pass. I was a teenager at Tannadice the last time we were relegated, in 1995, and it was a sad, sad day. I took my son to his first ever football match there earlier this season and that too was a rather sad day – a dire 1-0 loss to Hearts. But we football fans never lose heart for long and we’ll be back next season. Supporting a football club is like a marriage, it has to be for better or worse. Surely for we suffering Dundee United fans, things can only get better. Happy New Year readers. 2016 hasn’t started quite as well for me in a footballing sense as 2015 did. On the 1st of January 2015 I was at Tannadice to watch Dundee United triumph over Dundee in the derby, 6-2. It was a victory that even prompted some optimistic talk of us joining Aberdeen in a ‘new firm’ bid to challenge Celtic for the title. Sadly it turned out to be the sort of optimism that is so often found in those activating gym memberships at this time of year; it had mostly evaporated by the end of January (by which time three of our best players had moved to Celtic). I was not in Scotland this festive season and thus I wasn’t at Dens to watch us lose the New Year derby 2-1, a result that leaves us floundering at the bottom of the league – 11 points behind Kilmarnock who occupy the position above us. If a week is a long time in politics, a year is an eternity in football. In that period, the manager has been sacked and there’s been a major overhaul of the squad, not exactly for the better. It’s been a bit like an episode of 60 Minute Makeover in reverse. You don’t need to be as serial a pessimist as Private Fraser in Dad’s Army to nevertheless reach the conclusion that we appear to be doomed. Captain Mainwaring couldn’t save us now. Considerably more hope is invested in Jurgen Klopp saving Liverpool. So far, the German has made a good if slightly inconsistent start. West Ham v Liverpool was the first game that I watched in 2016 and it didn’t bring much cheer for a Liverpool fan. West Ham won 2-0 and did so comfortably. In press reports of the game I read that Klopp was angry at his side’s failure to give their all. One newspaper quoted him saying that they had only given “95%” while another suggested that he had said “90%.” If there’s only 5-10% more to be had from that side then I’m afraid we’re back in Private Fraser territory. I would say it was a 70% performance at best. Somebody should really check Lucas’s passport because it looks increasingly implausible to me that he can actually be Brazilian. I’m almost certain that if you picked a random guy of the Copacabana they would display greater skill than our number 21. Then there’s Clyne: a half-hearted sort of a full-back. He doesn’t mind going forward (although he shows only a moderate talent for it) but he’s bit less sure of things when called upon to perform defensive duties – a not altogether uncommon occurrence for a defender. In this aspect of the game he’s something of a liability, seemingly regarding it as all a bit inconvenient. He was out-jumped for both West Ham goals. Well, I say out-jumped, that’s actually a rather generous description of his efforts (well, I say ‘efforts’) to disengage his feet from the pitch. I think on one of the two occasions in question he got high enough that a slow motion camera would have been able to capture at least half of one of his studs. I once played for a manager who bemoaned such instances with the phrase: “couldn’t get a Sunday Post under you there.” The insertion of a Sunday Post beneath one’s feet would not require a very spectacular, salmon-like jump. One Liverpool player who could not be accused of lacking effort in his performance was Benteke. Sadly most of that effort was entirely ineffectual. Klopp has demanded more of his young striker in recent weeks and Christian ran around looking as lost as your average KL taxi driver (for those of you who haven’t been in a KL taxi, that’s generally quite lost). The overall performance had all the huffing and puffing that we’ve already come to expect from a Klopp side but nothing appeared very much at risk of being blown down. The fortunes of Liverpool and Dundee United are certainly pulling in different directions. There’s no question that Liverpool are improving under Klopp and there is a lot to be excited about at Anfield in 2016. Dundee United on the other hand, are on a run of results comparable to that of Donald Trump’s barber. 2016 is looking like a relegation year for us but we football supporters are required to make the same resolution ever year: we’ll support you ever more. 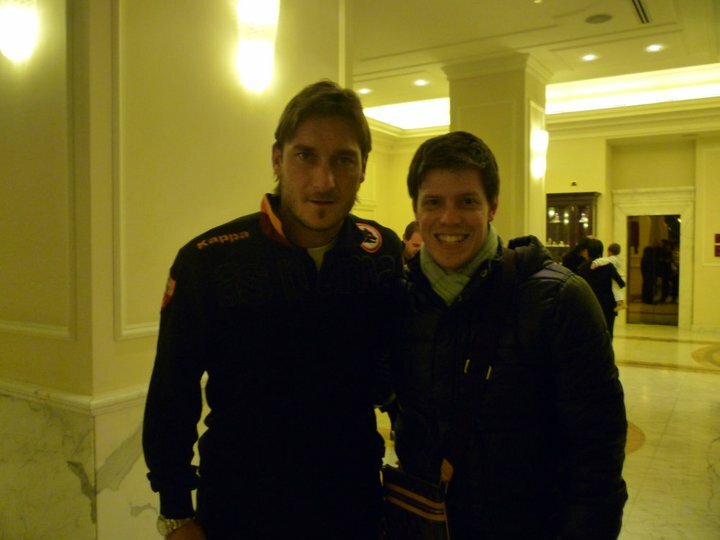 Totti and I. Milan, December 2010. Doesn’t he look pleased to finally meet me? I support 4 teams. That probably seems like a lot so let me explain. First, there is a hierarchy. In answer to the question, “who do you support?” my answer is Dundee United. It’s the team I grew up supporting – I was a season ticket holder in my teens – and they will always remain the teenage sweetheart of my footballing affections. I also support Liverpool, as my English team. Most football supporters in Scotland have an English team that they follow. Liverpool are mine because my best friend at school had family in Liverpool and thus he supported them. We used to watch lots of Liverpool videos together. It is 25 years since Liverpool last won the league title so at least I’m not often accused of glory hunting. My third team is Roma. Ever since I saw my first Serie A game on Channel 4’s Football Italia in 1992 (a 3-3 draw between Sampdoria and Lazio) it has been my favourite league. Back then, it was the best league in the world. That is no longer the case but I love it still. That love used to have a universal purity about it. I just loved Italian football in general and didn’t mind too much who won particular games. It was 2009 until I went to my first Seria A game – Roma v Juventus at the Stadio Olympico. I’ve been a Roma fan ever since. Last, and in all honestly least (but do not mistake that for a lack of passion, I speak here in very much a relative sense) there’s Rijeka. My wife is Croatian and Rijeka, the third largest city in the country, is her hometown. It is thus my adopted hometown and that comes with a duty of care toward the football team. As summer turns to autumn across Europe (or as one slightly less rainy season turns into a slightly more rainy season in Scotland) it feels like a reasonable time to assess the start that each of my teams have made to the new season. 2015 started very well for Dundee United but it doesn’t look as though it’s going to end that way. I was there on New Year’s Day to see us beat Dundee 6-2 in an extraordinary derby. A month later, the transfer window closed with two of our best players – Armstrong and Mackay-Steven – having escaped through it to Celtic. It’s been downhill faster than a bobsleigh race ever since. After it emerged that boss Jackie McNamara receives bonuses related to transfer fees (but is not involved in transfer negotiations), his stock has fallen quite significantly among some sections of the support. A fairly miserable run of form hasn’t helped. We currently sit second bottom of the table with just a single win from eight league matches this season. Only two players who started the derby on January 1st were in the starting line-up for last weekend’s 1-1 draw at home to Inverness Caledonian Thistle. The current squad is barely recognisable to me. I’ll be in Scotland next month and am intending to take my son to his first ever football game. We’ll be going to Tannadice to watch Dundee United v Hearts. I rather fear that every time he asks me, “Dad, who’s that?” I will have to shrug my shoulders and say I don’t know. 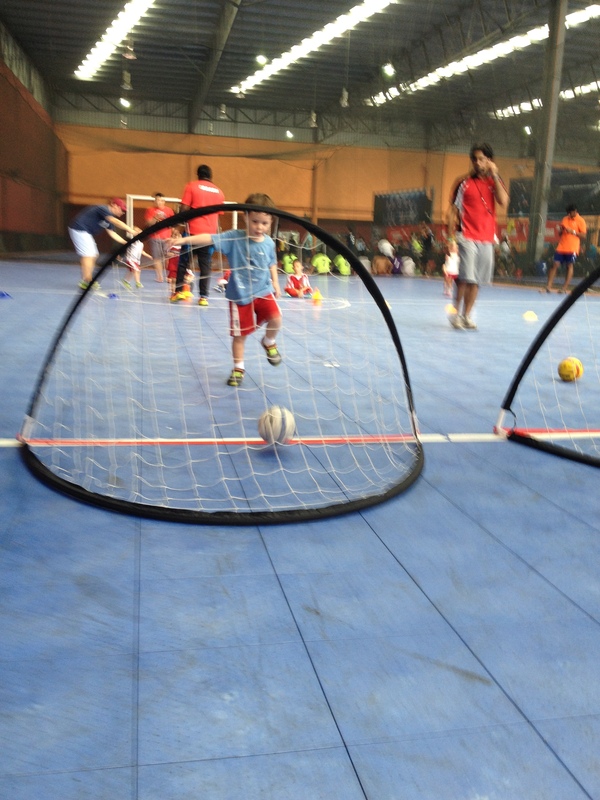 He’s five years old and the only footballer he really knows and recognises is Messi. A few weeks ago he asked if Messi will be playing when we go to the stadium. Sadly not son, sadly not. Things are not much better for my team south of the border. In fact, it’s pretty much all gone south at Anfield since Suarez left for the more southerly charms of Barcelona. I was happy to see him go such was the shame that he’d brought upon the club but it’s now very obvious that he absolutely carried that side to within a whisker of winning the league in 2013/14. At the time, Brendan Rodgers got, and seemingly deserved, a lot of credit. Managers take plenty of flak when their team is losing so they surely warrant some praise and a little singing when they’re winning. Whatever trust there was in Rodgers though is evaporating fast around Anfield and personally, I have lost all trust in him and his methods. Remarkably, it’s unclear how much influence the manager has over the signings that Liverpool make these days but it’s already evident that another summer of big spending is not likely to stave off another winter of discontent. Liverpool currently look miles away from being contenders for a Champions League place but rather less far away from League Two side Carlisle, who we scraped past in the Capital One Cup this week. On penalties. I simply can’t see Rodgers turning things around sufficiently. Earlier in his reign, the possession philosophy that he espouses looked as though it could develop into something exciting. Indeed, it briefly did as Suarez, Sturridge and Sterling (ably supported by Gerrard) menaced defences with their skill, pace and speed of thought. Now though, it just appears ponderous and visiting defences can scarcely believe how easy an afternoon out they’ve been treated to at Anfield. Talking of scarcely believable: Mark Lawrenson. On the 20th of September, Lawro wrote a column on the BBC website declaring that the 1-1 home draw with Norwich represented ‘fresh hope for new-look Reds.’ Really? Where he saw freshness, hope and something a bit different, I saw a stale, hopelessly inadequate performance that was eerily similar to many such performances in recent times. Much of Lawrenson’s analysis seemed to be based on the fact that Liverpool had far more touches in the final third in their game against Norwich than they managed the previous week. That game was away at Manchester United. Thanks for picking up on such a subtle and unexpected phenomenon there Mark. He also provided a couple of diagrams to illustrate the point for anyone who’s a little bit slower than one of our centre halves. Lawrenson is nothing if not a man of firm and unwavering opinions. He wrote another column yesterday. Now, apparently, “Liverpool have gone back to being a bit rudderless, characterless and seem to have lost their way.” No freshness, no hope, Mark? Not much else either. “No rhyme, no reason, no pattern of play. Liverpool had 40-odd shots and most of them were from outside the box. Carlisle, middle of League Two, kept them at arm’s length. It was very samey. You are looking and thinking ‘what the hell is happening here?”. From “new-look” to “very samey” in just four days. Much more of the same and it will be the dug-out that has a new look. Klopp is available and rumour has it he’s interested. Things definitely wouldn’t be too samey under the German. And so to Rome. When in Rome … support Roma, as the saying goes. Or something like that. I visited the Italian capital in 2009 and I was delighted that my stay coincided with one of the biggest matches in Serie A – Roma v Juventus. My ticket cost me €110 so it’s perhaps not surprising that I felt as though I was signing on for life as a Roma fan. At the club shop they assured me there was only one area of the ground that still had tickets available, and of course it was one of the most expensive areas. When the game kicked off with lots of empty seats in various other parts of the stadium, I had the feeling that I might have been taken for a bit of a Roman ride. Roma lost 3-1 to Juventus that day and it seems as though they’ve been trying to catch up with the Old Lady of Italian football ever since (which turns out to be harder than that makes it sound). Last season, Juventus did the league and cup double as well as reaching the final of the Champions League. Roma finished in second, 17 points behind the champions. Can they sustain a title challenge this time round? The early signs are reasonably encouraging but that’s based more on the shaky start that Juve have made rather than anything particularly convincing from Roma. Last weekend summed up why Roma have come close but ultimately fallen short in recent years: too many draws, especially at home. Last weekend it was 2-2 against Sassuolo. Totti scored one of the Roma goals; his 300th for the club. A week short of his 39th birthday, the Roma captain is a truly legendary figure. He only has one Serie A winner’s medal to his name (he’s finished runner up on eight occasions) and I hope that he claims a second one next May. That would possibly make him as happy as I was when I met him in Milan in 2010 when my wife and I ended up staying in the same hotel as the Roma squad (see picture above). Next week I will be in Rijeka, enjoying some rest and recovery after running my first ever marathon (here in KL on October 4th, and for a very good cause: https://www.justgiving.com/Craig-Wilkie/). Sadly there’s no domestic football on while I’m there but there is an international fixture – Croatia v Bulgaria in the European Championship Qualifiers – so I might make it to that. Rijeka’s stadium, Kantrida, is the most beautiful location that I’ve ever watched football in. Cut into a cliff on one side, with the shimmering Adriatic Sea on the other, it’s a glorious setting for the beautiful game. The football of course is not always quite as spectacular as the surroundings but the last couple of seasons have brought much to cheer for Rijeka fans, including two excellent runs in the group stage of the Europa League. Last season a title charge looked a real possibility but Rijeka fell away slightly in the second half of the season following the sale of star striker Kramaric to Leicester. I expected him to take the Premier League by storm but so far he’s been a whole lot less than prominent. In fact, I’m almost certain that there are streakers who have spent more time on the pitch than Kramaric this season. Dinamo Zagreb went on to win the league and finished the season unbeaten, the first time that’s ever happened in the Croatian top flight. Few would bet against Dinamo retaining the title and their 2-1 victory over Arsenal in the Champions League suggests they might even be a force in Europe as well this year. Nevertheless, Rijeka are off to a reasonable start (despite exiting the Europa League in Aberdeen) and currently sit in second place, five points behind Dinamo but with a game in hand. All four of my teams drew last weekend; I didn’t get to feel the exhilaration of victory but at least I avoided the despondency of defeat. They all have winnable matches this weekend so I’m expecting three points to be collected somewhere. Those then, are my teams. I’ll support you ever four. Happy New Year all. This is my first post of 2015 and I hope and intend that it marks the start of a productive blogging year. 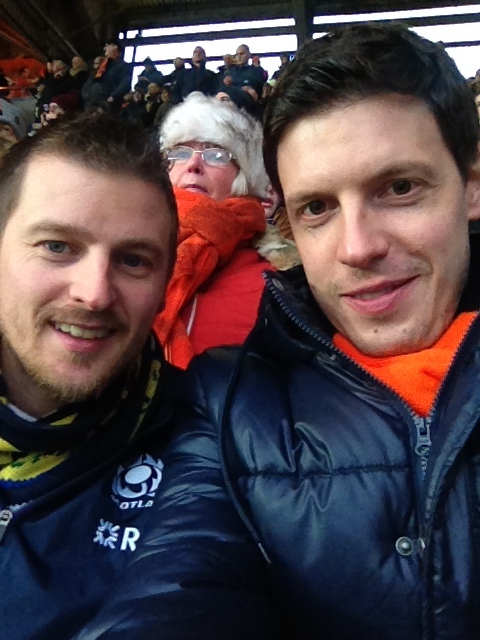 2015 got off to a very happy start for me when my brother and I went to the Dundee derby on New Year’s Day (I’m the handsome one pictured above). A plonker indeed. In his defence, his wife had just given birth to their first child (my beautiful nephew) a few weeks before so he did have one or two other things to concern himself with. His email to the Dundee United ticket office informed them that both he and I used to be season ticket holders but having both moved away from Scotland we now very rarely get to games. He also informed them that I was travelling all the way from Malaysia. 20 minutes later his phone rang. It was the ticket office offering him two tickets that had been returned. Merry Christmas and relief all round. With tickets secured we arrived at Tannadice at 11.30 am on New Year’s Day to pick them up ahead of the 12.15 pm kick-off. It was a wet and windy day in Dundee but mercifully not quite as cold as we’d been expecting. In the days before there had been some tentative discussion of investing in long johns but in the end they remained unpurchased as we manfully opted to do without them. Asked how I would ward off the cold, I suggested that I’d pursue a regime of vigorous rubbing as required. Such a regime turned out not to be needed as we basked in the warmth of a great performance by our side in a quite remarkable game. No sooner had we sat down than we were back on our feet to celebrate the opening goal as Stuart Armstrong gave us the lead after about 40 seconds. He didn’t know too much about it, the ball deflecting in off his back from an Erskine volley. Dundee’s goalkeeper, Schenk, was making his debut and his first task was to pick the ball out of the net. After scoring so early United then sat back and became rather complacent. Dundee recovered well and by 10 or 15 minutes into the game they had become the more dominant of the two sides. Much of their attacking threat was being carried by Harkins a man of some considerable skill and some equally considerable heft. It’s a long time since I’ve seen a professional footballer look so unathletic. The question of ‘who ate all the pies’ went unasked since the answer was so obvious. Dundee deservedly equalised on 24 minutes when Stewart curled a magnificent free kick into the top corner. We United fans, who had hitherto been in excellent voice, fell rather quiet. The equaliser had also upset our pre-match predictions: I had predicted that we would win 2-0; my brother, almost always more confident than me in such matters, had gone for 3-0. It took a mere three minutes for us to find our voices again however as Mackay-Steven restored our lead with a dipping curling effort from out wide on the right. At the time I wasn’t sure if he had meant to shoot or was just aiming a cross towards the far post and I’m not much clearer after watching the highlights of the match and seeing several replays of the goal. I’m sure he’ll claim he meant it and I’m not going to argue. Four minutes later it was 3-1 as Erskine cut inside from the right and finished low into the far corner. All our attacks were coming down our right wing at this stage and Dundee’s left back, Dyer, was living up to his name. I was amazed that his manager didn’t invite him to take an early bath at half-time. There was still time for another goal before half-time and again it came from the same area as Mackay-Steven ran on to a great through ball from Armstrong before applying a cool finish. Schenk in the Dundee goal picked the ball out of his net for the fourth time in the first half of his debut for the club. Happy New Year! I suspect it was a slightly different message that Dundee manager Paul Hartley had for his players at the interval. The early stages of the second half were more even and it wasn’t until the 64th minute that we scored again: Fojut rose highest to nod home from a corner. This was the cue for many Dundee fans to make their exit. “Why on earth are you still here?” (or words to that effect) we politely enquired of those that remained. It was a question they were probably asking themselves by the 83rd minute when young Charlie Telfer casually stroked in a 6th for us. Those Dundee fans that did remain to the bitter end were at least rewarded with a 90th minute consolation, cleverly converted by Tankulic. The ref took pity on the visitors and played just a minute of stoppage time before blowing the final whistle. We rejoiced and silently thanked whoever it was who had returned their tickets. It doesn’t get much better than being there for a 6-2 derby victory to start the new year. Paul Hartley trudged off dejectedly while United boss Jackie McNamara strolled down the touchline beaming and offered a pumped fist above his head as he disappeared down the tunnel. Hartley and McNamara were two of the most composed and elegant Scottish players from the mid-1990s until they both retired about four years ago. Now as young bosses managing in the top flight (Hartley is 38 and McNamara is 41) they are instilling similar qualities in their teams. Both sides tried to play decent football in what were quite difficult weather conditions and succeeded to a commendable extent. There’s a lot of doom and gloom surrounding Scottish football at the moment and some of it is understandable but I came away from Tannadice feeling positive about the future. The game in Scotland is in good hands with the likes of Hartley and McNamara (and of course Gordon Strachan with the national team) and hopefully there’s a lot to look forward to in the rest of 2015.